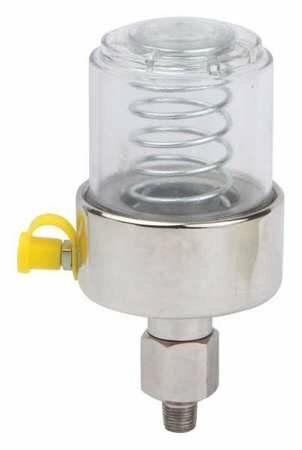 Grease Feeder, Polycarbonate, Nickel Plated Aluminum Base, Capacity (Oz.) 2 oz., Dia. (In.) 2-3/8, Height (In.) 4-5/8, 1/8 NPT, Operating Temp. (F) -10 Degrees to 250 Degrees F, Spring Tension (PSI) 1 to 2, Corrosive Environment for Dynamic Applications Involving Vibrations and Shock, Includes (2) Spare Springs, Grease Fitting Cap.